5.6.1909: Launched by Cook, Welton & Gemmell Ltd, Beverley (Yd.No.180) for Hellyer’s Steam Fishing Co Ltd, Hull as YORICK. 12.8.1909: Registered at Hull (H49). Charles Hellyer appointed manager. 1.1.1914: Tonnage altered to 87.23 net under provision of Merchant Shipping Act 1907. 27.11.1919: Sold to Hull Northern Fishing Co Ltd, Hull. William R. Nowell appointed manager. 3.1.1930: Sold to Hellyer Bros. Ltd, Hull. Frank O. Hellyer & Owen S. Hellyer appointed managers. 1931: Sold to Jenkerson & Jones, Milford Haven. T. Jenkerson designated managing owner. 1932: Sold to Hellyer Bros. Ltd, Hull. Frank O. Hellyer & Owen S. Hellyer appointed managers. 14.11.1935: Sold to Alexander Hay, Aberdeen. 21.11.1935: Registered at Aberdeen (A382). Alexander Hay designated managing owner. 2.1941: Sold to Hellyer Bros. Ltd, Hull. 2.1941: Registered at Hull (H410). Owen Stooks Hellyer appointed manager. 3.7.1944: Sold to Ocean Steam Fishing Co Ltd, Hull. William Leslie Barkworth appointed manager. 5.2.1946: Sold to Odafoam Ltd, Liverpool. William Stevenson, St. Anne’s-on-the-Sea appointed manager. 12.1946: Sold to Grateful Steam Fishing Co Ltd, Aberdeen. 4.1.1947: Registered at Aberdeen (A247). 1955: Sold to BISCO for £2,525 and allocated to Shipbreaking Industries Ltd for breaking up at Charlestown, Fife (Contract No.86D). 2.8.1955: Delivered Charlestown from Aberdeen under own power. 9.2.1956: Aberdeen registry closed “Vessel broken up”. This entry was posted in Seasonal Visitors, Steam Trawlers and tagged No Fleetwood owners on November 29, 2016 by Fred Smith. 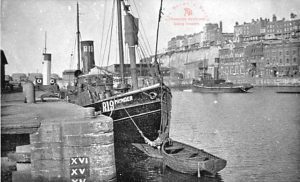 23.5.1906: Launched by John Duthie Torry Shipbuilding Co, Aberdeen (Yd.No.291) for The Walker Steam Trawl Fishing Co Ltd, Aberdeen as STAR of LIBERTY. 30.10.1906: Registered at Aberdeen (A88). Andrew walker appointed manager. 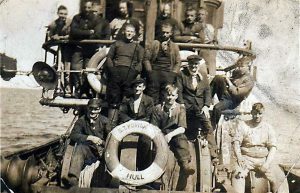 11.5.1908: Arrived Aberdeen from an Icelandic trip reporting boat lost when howmewards due to stress of weather. 7.5.1912: Aberdeen registry closed. To fish in South African waters. 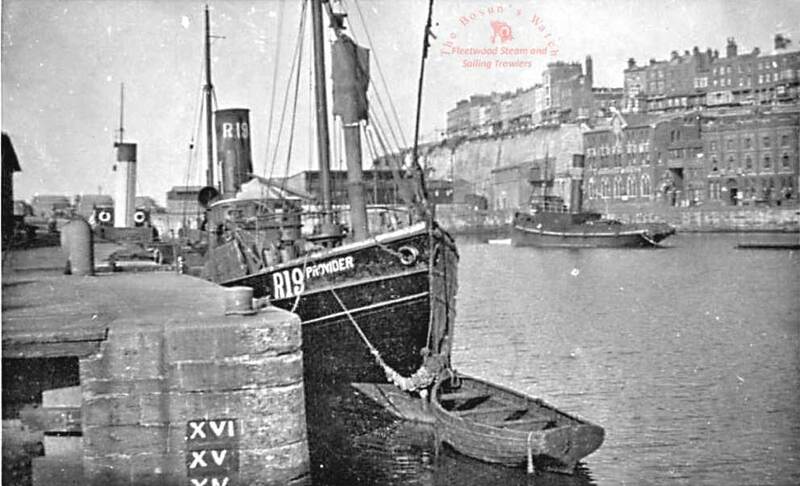 14.10.1912: Laid up in Victoria Dock, Aberdeen and advertised for sale in ‘Aberdeen Journal’ Interest shown by the French Government and sale to French nationals confirmed. 1912: Sold to Soc. Anon. des Pêcheries de Biarritz, Biarritz. Renamed GRAZIELLA. 1915: Sold to Rene Pettit, Dieppe. Registered at Dieppe (D-1659). By 1925: Sold to Brunet & Ledoux, Boulogne. 1927: Sold to Brunet & Co, Boulogne. Dieppe registry closed. Registered at Boulogne (B-??). 1928: Sold to Stephen Fishing Co Ltd, Aberdeen. 6.9.1928: Registered at Aberdeen as GRAZIELLA (A368) (Minute M/RG1352/28 dated 20.8.28). 2.12.1928: Registered at Aberdeen as JANE STEPHEN (A368). Thomas Stephen appointed manager. 8.1933: Sold to William Wray, Hartlepool. 9.1933: Registered at Hartlepool (HL61). 9.10.1933: Registered at Hartlepool as EILEEN WRAY (HL61). William Wray designated managing owner. 7.2.1934: Homeward from fishing grounds (Sk. Ben Trueman), when some 200 miles from Hartlepool ran into very heavy weather and NW gale; boat lost, wheelhouse window stove in and some deckpound boards washed away. 14.3.1935: Landed a Royal sturgeon – 3 stone and 5ft in length. 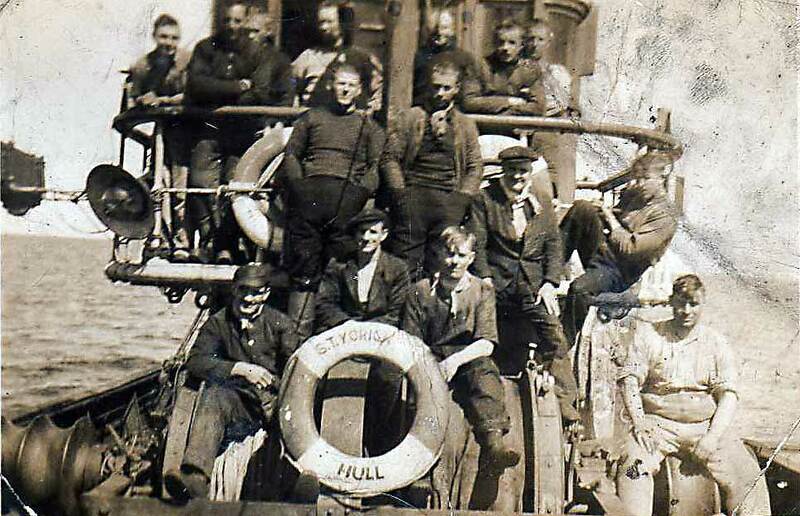 17.12.1939: Off Hartlepool badly damaged by German aircraft, towed into Hartlepool but later foundered; no casualties. 12.1939: Salved, repaired and returned to service. 14.11.1940: Sold to Saint Andrew’s Steam Fishing Co Ltd, Hull. Basil Arthur Parkes, Cleveleys appointed manager. 1942: Sold to Hellyer Brothers Ltd, Hull. 18.12.1942: Registered at Hull (H8). 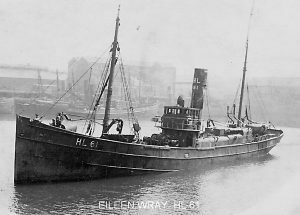 10.1945: Sold to Humber Trawlers Ltd (64/64), Grimsby. 19.10.1945: Registered at Grimsby (GY108). 19.10.1945: Joseph Reynolds Cobley appointed manager. 3.11.1945: Vessel mortgaged (64/64) to National Provincial Bank Ltd, London (A). 1952: Sold for breaking up. 23.5.1952: Grimsby registry closed. “ Ship broken up ”. This entry was posted in Steam Trawlers, Steamers (Picture) and tagged No Fleetwood owners on May 6, 2016 by Fred Smith. 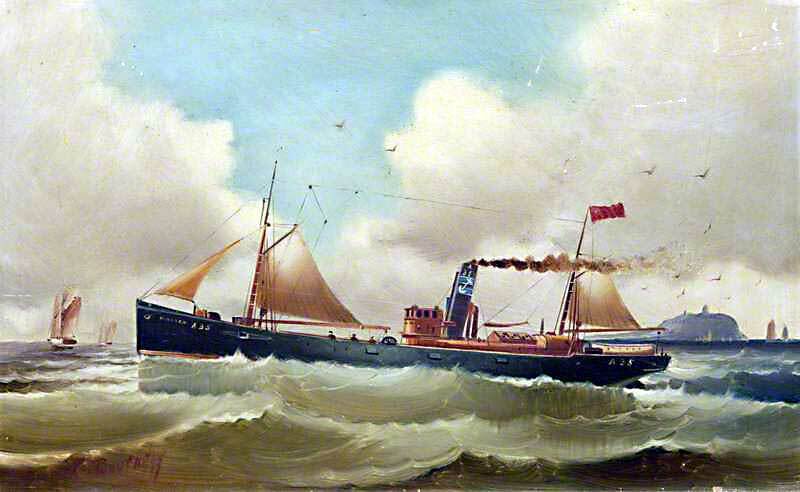 12.2.1895: Launched by Cochrane & Cooper, Beverley (Yd.No.122) for The Anchor Steam Fishing Co Ltd (64/64), Grimsby as MONARCH. 13.3.1895: Registered at Grimsby (GY748). 13.3.1895: William Somerville Letten appointed manager. 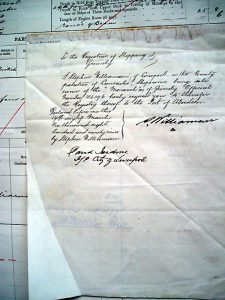 15.3.1899: Sold to Stephen Williamson (64/64), Liverpool. 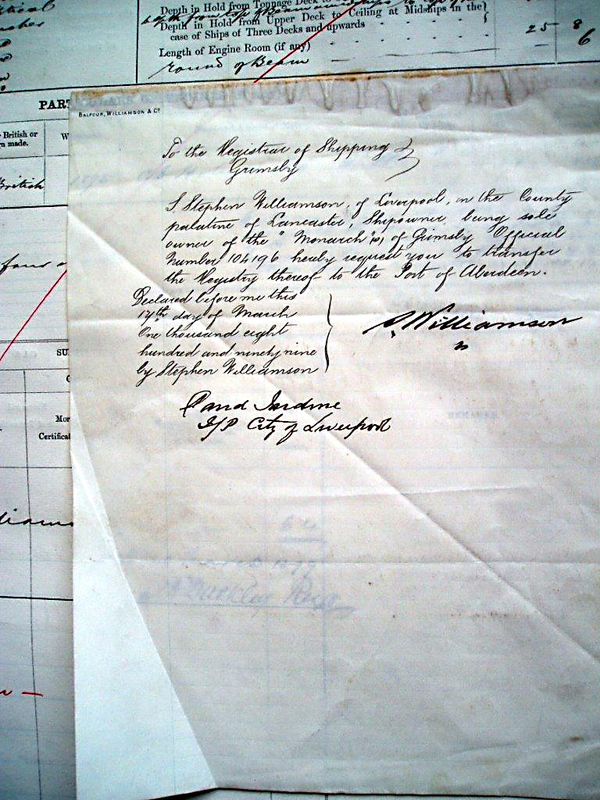 17.3.1899: Request to transfer registry to Aberdeen. 30.3.1899: Registered at Aberdeen (A35). Michael Doig appointed manager. 1906: Sold to Thomas Davidson (64/64), Aberdeen. 1.1.1914: Tonnage altered to 53.96 net under provision of Merchant Shipping Act 1907. 29.5.1917: Requisitioned for Fishery Reserve. Renamed MONARCH IV. 1919: Released and reverted to MONARCH (A35). 6.2.1929: Sold George Allan Breach (21/64), Louisa Breach (21/64) and William Hutchings (22/64), Lowestoft. 6.2.1929: Registered at Lowestoft (LT14). William Hutchings designated managing owner. 1935: Fishing from Fleetwood. (Jack Breach Ltd managing agents). 12.12.1935: Sold to Louisa Breach (43/64) & George Allan Breach (21/64), Lowestoft. John Victor Breach appointed manager. 9.1938: Sold to Belgium for breaking up. This entry was posted in Steam Trawlers, Steamers (Picture) and tagged No Fleetwood owners on April 18, 2016 by Fred Smith.